CHICAGO -- Thousands of anti-violence protesters marched along a Chicago interstate on Saturday, shutting down traffic in an effort to draw attention to the gun violence that's claimed hundreds of lives in some of the city's poorest neighborhoods and pressure public officials to do more to stop it. Some stopped to write on the road with chalk: "Enough is enough" and "Peace." Toward the front of the march, Rev. Michael Pfleger, who organized the protest, Chicago police Supt. Eddie Johnson and the Rev. Jesse Jackson linked arms. 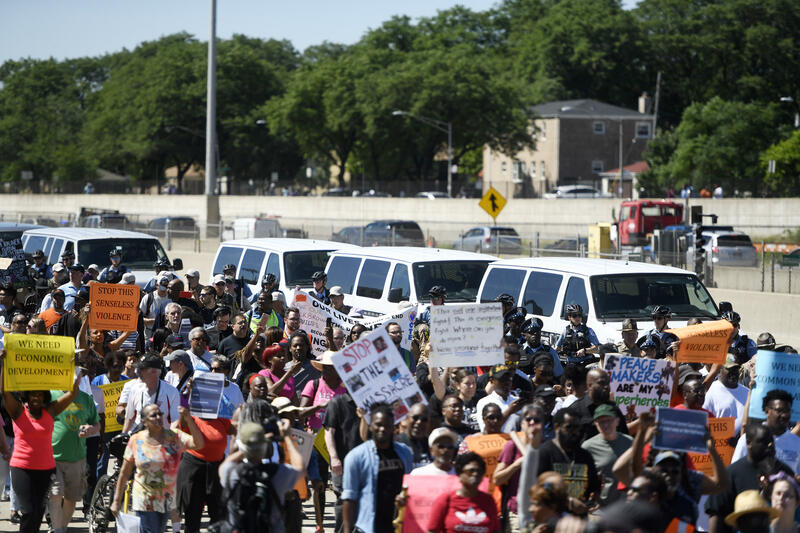 But Pfleger and protesters insisted there was no agreement and that they would shut down the entire northbound roadway, with Pfleger noting the city closes major roads for parades and other occasions. The crowd began creeping into other lanes -- a situation Pfleger said had the potential to become dangerous. Illinois State Police, which has jurisdiction over expressways, announced around 11:30 a.m. that they were shutting down all northbound lanes of the expressway. Protesters then began walking northbound along a roughly 1.5-mile route. "Today we got their attention," Pfleger said afterward. He said the next step is accomplishing the actual goal -- an "aggressive plan" to address the violence. Among the demands the protesters listed were more resources, jobs and better schools for their communities as well as stronger gun laws. There's a historical significance to marching along the Dan Ryan Expressway -- a roadway some believe was built in the early 1960s to separate white communities and poor, black ones. To the west of the new interstate were Comiskey Park, home of the White Sox, and neighborhoods such as Bridgeport, home to then-Mayor Richard J. Daley and his clan. To the east rose the Robert Taylor Homes, a high-rise public housing complex that became notorious for its violence. Last year, young men on the city's South and West Sides told CBS News how easy it is to obtain illegal guns, and why many never leave their homes without one. "I know people who can't walk from they house to the store without a gun," said Aaron Murph. "Because people getting killed left and right. It's sad." "I got shot twice and I could have been gone but I'm still here so, that scar, that's with me, so," said Tyshaun Grant. "It's hell on earth."